Earlier today, Huawei Philippines has officially started selling their much awaited P30 and P30 Pro in the country, and just a few hours later, the brand has announced that they already sold 650 million pesos worth of phones, the P30 Series to be exact! To give a quick recap, the Huawei P30 Lite became available last April 10, while the Huawei P30 and P30 Pro are just in today. The Lite costs Php16,990, the P30 for Php36,990, and the Php50,990. Assuming that they sold an equal number of each model, then that will just sum up their prices (Php104,970), divide that number to Php650M, then multiply it by 3, and we get 18,577 devices! That's quite a huge number for just a 4-day period!! This simply means that the marketing effort of the local Huawei team is indeed effective. 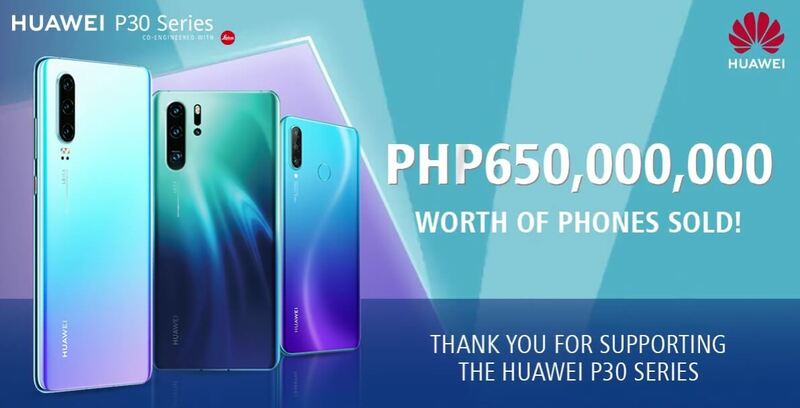 And, for us, the freebies that Huawei throw-in during the pre-order period are also pretty huge in value, especially the free Huawei M5 Lite tablet and Huawei GT Watch, worth almost 32K in total, for the P30 and P30 Pro. Are you one of those who bought the P30 series? Are you satisfied with your purchase? What freebies did you get? Share your thoughts and experiences in the comment section below.